A feast was held today! 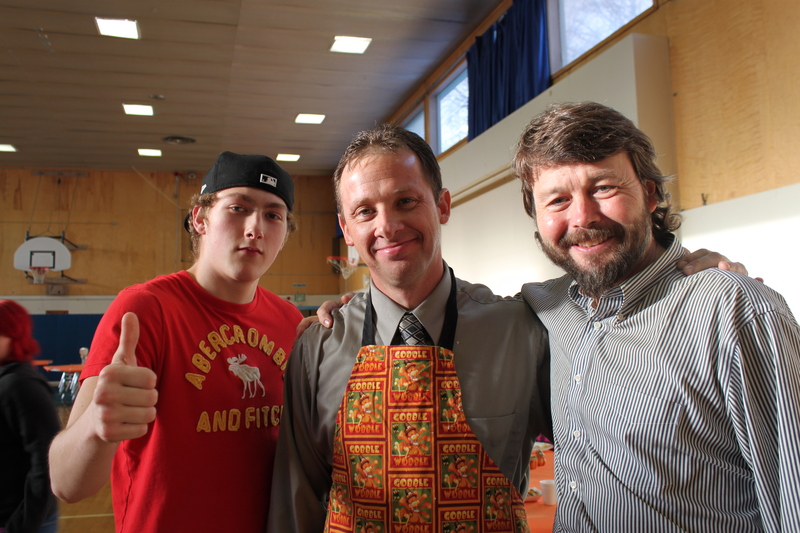 Kenai Alternative High School served their 21st annual Thanksgiving Day Meal to 166 parents, students, and invited guests–many who were community members active with the high school throughout the year. Greeters at the door welcomed everyone with hellos and smiles. What a contrast to the frigid, wind-to-the-bone noon day winter sun! Smells flooded the hallway–turkey, gravy, mashed potatoes–my taste buds quivered when I took the few steps to the gym. Inside, more students welcomed everyone who gathered and stood in line for the feast! Students said they’d been cooking since the previous Friday, and shared the story of oh, so many spuds. After a meal fit for a king (or queen) I wandered the room with my camera, talking to students, a 2011 graduate who had returned to help, and community members. At one round table members from local churches explained to me they cooked a hot meal each morning for the students, five days a week, serving between 25-70 breakfasts each day. Another table of pre-school students wore festive hats, and posed for several delightful photos–little faces complete with the remnants of pumpkin pie crumbs. High school students were warm and welcoming, thanking me for coming. A young Mom took a few minutes to visit while she rocked her baby to sleep in his stroller (except I kept smiling at him so his eyelids were slow to close.) A few photos from the day are in the Kenai Alternative High School photo album at the KPBSD Facebook page. Let us give thanks for these students, for their parents, community members, and for everyone who shared a meal together. The noon-day sun flooding through upper windows in the gymnasium highlighted warmth in the belly, mind, and heart of all who gathered. Thank you Kenai Alternative High School–may you continue this tradition for decades to come. The community appreciates you–and clearly you appreciate students, parents, and local residents. This entry was posted on November 15, 2011 at 6:31 pm. You can follow any responses to this entry through the RSS 2.0 feed. You can leave a response, or trackback from your own site. 1 Response to "Giving thanks in Kenai"
Thank you all for a great afternoon of feasting and fun with friends. The food was excellent and the mashed potatoes were “out of this world”…you all worked hard and it showed!! !